Examining the racial breakdown of the 2016 Emmy Awards highlights a major divide in terms of diversity among shows and actors. 2016 saw perhaps the strongest push towards equal representation of race in media. New shows like Black-ish, Empire, Atlanta, and Insecure have put black actors in the forefront, and the buzz that followed fiercely flooded the internet. Not only did these shows feature casts predominantly comprising people of color, they were also wildly successful. Reddit threads, articles and blogs praised the shows and networks for finally allowing non-white actors to shine on mainstream TV. But have we come far enough? Not with Asian American actors, according to data from the most recent Emmy Awards shows. Currently, there are only two shows on air with Asian American leads: ABC’s Fresh off the Boat and Aziz Ansari’s instant classic Master of None. And the last show to air on television with more than two lead actors of Asian descent was over 20 years ago with Margaret Cho’s American Girl, which enjoyed only one short-lived season while only really being acknowledged for its offensive humor based on caricatural stereotypes. In terms of Asian American representation, Fresh off the Boat and Master of None seem to be steering television in the right direction, playing less on stereotypes and more on “authentic” character. For example, both series depict, in a light, comedic and digestible way, the lives of first-generation Asian-American children that have grown up in immigrant households. But while the shows have high ratings and large followings, they haven’t actually drawn too many awards. Let’s look at the 2016 Emmy Award nominees and winners. Molly Fitzpatrick, a journalist who wrote article “Of 800 main cast members on 100 network TV shows, just 52 (6%) are of Asian descent,” which looked at data on TV shows with Asian American actors in 2015, told me that the best way to look at the problem was to go through series and tally up the number of Asian actors that appear. I did something similar with the results of the 2016 Emmy’s to see how many Asian actors and shows with Asian characters received recognition. In fact, finding data on Asian American representation in media isn’t exactly an easy feat. Momo Chang, content manager for the Center for Asian American Media, pointed me to some older scholarly data, but nothing current. 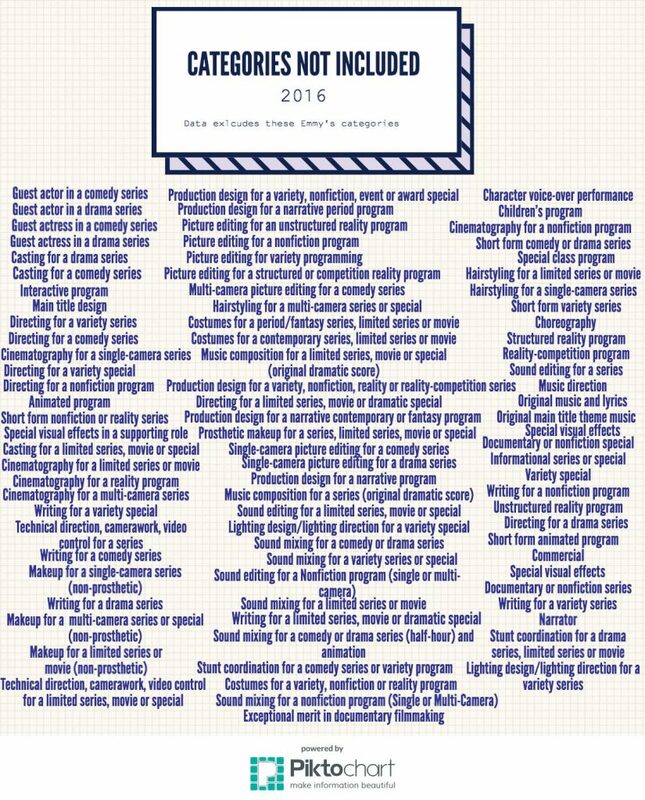 Below is data organized by show and actor and a tally of wins and nominations in the more popular categories. Only three Asian American actors were nominated. None won. American television shows are off to promising start in embracing Asian characters. But where they’re making baby steps they should probably instead be taking bigger, bolder racial strides; strides that will reach a point where more than just three of the more than 100 actors nominated are Asian. In our heated political climate, Trump’s immigration ban has become an extremely prevalent issue, so we were interested in getting a more firsthand and direct perspective from people of the Muslim faith. This immigration story focuses on the Muslim ban, and specifically how it impacts the community here in Waltham. Qiyu visited the Waltham Islamic society to chat with teachers and the chairman of the community and asked them about their opinions on the ban and also about living in America as a Muslim. Here are photos and also snippets of what Fatima, a teacher she interviewed, and Blue Karim, the chairman, had to say about the ban. Before entering the Islamic Society, one must take off their shoes. From young children to older adults, members come to the center for prayer on weekends. Two male members pray. Men, women and kids generally separated for prayer. Q: Have you ever experienced discrimination from society as a Muslim woman? Q: Do you keep up with news about the Muslim ban? How do you feel about the ban? WUDU: one must clean their body before they pray. Prayer project the students worked on. Q: What is your general opinion on the ban? Q: Do you keep up with news about the Muslim ban? Q: Have you noticed a difference in the Muslim community since the ban? Q: Have you participated in any anti-ban protests or movements? A Muslim mother and her child get ready for the events of the day. Kids listen attentively as prayer leaders begin the session. The Waltham Islamic Society was very friendly and welcoming. They told us that regardless of the ban, the community center has always and will always support the Muslim community of Waltham. According to Karim, most of the community actually do not keep up with news about the ban. And as far as he knows, there has been 0 reports of Muslim community members being denied entry into the US. They remain rather apathetic towards the ban because they believe American values strong will lead to equality and justice. I got in contact with Derek Watkins, graphics editor for The New York Times, to ask him how he went about creating the data visualization for NYT article, “Greenland is Melting Away.” The article, which features intriguing interactive graphics, details the scientific quest of a team of researchers whose goal was to collect samples from the network of rivers along the ice sheets of Greenland in order to make conclusions about the rate at which Greenland is melting. They used the data in order to correlate rising sea levels with global warming and to better understand climate change in general. The first visual, which features a scrolling interface, zooms in and out on the satellite imagery to show pictures from far ranges (a map created by Derek) all the way to close ups of the scientists’ campsite of tents and a research facility. It also offers clear snapshots of the vein-like rivers. The second visual, “pulls back,” as Derek describes it, or initially zooms out then in to show areas where flow rates were measured. IT: There were a few people working on this project/article, what parts specifically did you work on/contribute to it? DW: The four bylines that are on the project are me, Larry [Buchanan], Josh [Haner], and Coral [Davenport]. All four of those people were kind of involved from the beginning of that article. Actually, that’s not true. Coral and Josh had gone to Greenland and done their reporting, but then when they came back, we were all kind of involved from the beginning of the writing process of actually like putting the article together. So part of what I did and my colleague Larry, who was also in the graphics department at the Times — part of what we did was help the story planning and work with Coral, the writer/reporter, to try to figure out what the best way to put the story together was so that the visual elements, like the drone footage that Josh captured on the ice sheet and the graphics that we were gonna be producing, would fit in with the writing and kind of one would flow into the other. And then beyond that, just like once we actually started like creating the article, Larry and I worked on basically the portions that kind of zoom in into the ice sheet there. That was like the main focus, but then we also handled the design of the article like making font choices and just like actually coding that design in HTML and CSS. So we handled that also, but the grunt of the work was on the interactive zooming parts of the article. IT: Early on in the brainstorming process, what did you want this project to achieve? DW: So one kind of central part of this story, right, was this idea that we are bringing you down to meet the people that are on the ice sheets, that are actually like spending time and their lives investigating this one aspect of climate change. So it was kind of taking this huge, multifaceted issue and boiling it down to these handful of scientists that are actually living in tents on the ice sheet, and so that was kind of the overarching goal: to use the visuals to make that point, and we ended up doing it explicitly. Like starting really big at the ice sheet and zooming in and in and in until you land on their little camp next to this little temporary lake. That was kind of the initial motivation: to do the zoom from way out thing, but then we also, farther down into the story, we used that same mechanism to pull back out and actually lay some data over the satellite imagery to kind of contextualize what we’ve been talking about elsewhere in the story to say like we’ve been focusing on this one moulin that the scientists are researching, but then when you pull back there’s actually hundreds of them all over the ice sheets so this isn’t just the problem that you’re seeing in the photos and in the writing; it’s actually a much bigger thing. IT: How did your team attain the data collected and then organize it? What specific parts of the data did you want to visualize? Did you get the data from Coral who was doing the research in Greenland? DW: No, in this case, none of the data came from Coral, sometimes that’s the case. It kind of just depends. In this case, Coral put Larry and I in touch with Laurence Smith who was one of the characters in the story. She put us in touch with him and then we were like emailing back and forth with him as we were kind of thinking about the visuals that we might do and we had like several conversations with him. At one point we spent an hour having him explain to us the mechanisms by which these moulins burrow down into the ice because we thought at one point that maybe we would have a diagram of how these kind of rivers burrow through the ice and then come out underneath the ice sheet. But we ended up like not even doing that diagram, right, but that’s kind of the process. You just kind of speak with, in this case, the researchers to the characters of the story and just try to slowly brainstorm and think about what visuals might be best to support the points we’re trying to make in the story. And over the course of those conversations, you’re asking them “what data do you have?” And “do you know other researchers that might have the data?” and stuff like that. I think it ended up that Laurence Smith knew some other researchers that he had worked with that had the satellite data that we ended up overlaying, and so he put us in touch with them and they had written like an academic paper basically about the same data that we show in our piece, and they were gracious enough to give the data to us that they used in that paper and so we were able to visualize it. That’s kind of how that one came together. But in general, it’s always kind of a very fluid process where you have an idea, like “I’m not sure if that data exists” so you get in touch with the people that know whether or not it exists and then depending on what data is out there, you might have to change your idea or take a different approach. IT: So once you received all the data, how did you code both of the of interactive satellite graphics? What were the steps? What tools or techniques were employed to create it? IT: Yeah, if you could get as specific as possible in terms of the technologies, that would be great. IT: You said it took several weeks to make, so on an average day, how long/how many hours would you spend on the computer working on the coding? DW: I guess it depends. When we’re on the end stages of a project like this, I could spend all day coding. And I definitely did spend several days doing just that. But usually it’s not that we’re only writing code, right. Usually there are other tasks to do and so we were kind of doing maybe some reporting. And then also in practice, we’re usually juggling two or three projects at a time, so maybe we need to work on this a little bit, but then work on the coding for the early stages for another project. So usually it’s a bit more broken up than that. It’s usually only when we’re pretty close to a deadline and things need to get done that we would spend like all day writing just pure code. But overall, something like this definitely takes several days of coding. Not totally sure how long this one took exactly because it was broken up like I was saying before, but it definitely, you know, took like several tens of hours, at least. IT: What were the biggest challenges in creating the graphics? DW: I think just from a technical point of view, it was pretty difficult to get everything to line up the way that we wanted it to. That was probably I guess the most difficult part: just making sure that the transitions were very smooth and that you couldn’t see the points at which were fading between one image and another so that it felt like this very smooth animation. IT: What does this project not show that you wish you could have fit in? DW: I don’t know; there were definitely other aspects of the story, like the thing I was talking about before where we were considering doing the diagram of how these things dig into the ice sheets. There’s always things like that — there’s always more information that you could throw into a story. But I don’t know if I would say that the story would be improved if we put that in there. You know, like, we made the conscious decision not to put it in because we wanted to keep the story focused on the most important things that we wanted to communicate, so I feel pretty happy with how the story turned out. And I mean, typically, we’ll end up with more regrets about what we could have done with a story if we’re on a very short time frame. But with a story like this, we had enough time to really plan it out and be specific about what we wanted to include and where we wanted to include it. So with this story, I think we had enough time to make it the form that we wanted it to be in and to make specific choices and was able to execute on those. So in this case, I feel pretty good about what we ended up including and I don’t have any large regrets. IT: From data gathering to digital design, what advice do you have for journalists trying to build similar visualizations? Splayed on the table were face masks and initiatives on how to revolutionize, important dates of rallies and protests, and phone numbers of important hotlines and organizations: ingredients necessary for Inauguration Detox: event hosted by Things Magazine this past Saturday in Cambridge, MA. Post-election sentiments hit many, especially for those who could not directly impact the election — namely, high school students under the age of 18. Things, arts-focused online publication serving as a vehicle specifically for indie teen artists to showcase their work, led an open forum-gathering for teens to come together and discuss Trump’s inauguration and current events. The temporary safe space also provided warm beverages — tea and hot chocolate — and arts and crafts materials in the Democracy Center in Harvard Square. The zine’s first meetup of 2017, the evening began with staff writers, readers and friends opening with icebreakers around a close-knit circle. Everyone was encouraged to pick a prompt from a bowl, with fill-in-the-blank statements such as “one course of action I plan to take against this oppressive statement is…” or “this election impacts me because…” Recurring answers included more participation in upcoming matches and fear for Trump’s executive orders and anti-immigration policies, respectively. Participants came from several different backgrounds including Muslim, Hispanic, Black and Asian. Issues brought up ranged from the necessity of intersectionality in all movements to whether or not it’s possible to be friends with a Trump supporter. Icebreakers lead to a conversational, open discussion “moderated” by senior editors. The event allowed students to get to know one another and also meet the faces behind the magazine — content creators and readership alike were all teens, 15-18 years old; it also connected youth deeply involved with politics and passionate about social justice. Both beauty treatments and candid discourse seemed to be effectively detoxifying for all. Author itruongPosted on August 25, 2016 1 Comment on Hello world!